This female is on 7 eggs. If all goes according to plan, the first one should hatch very soon. Below is a video of CARRI’s director releasing some rehabilitated Barn Owls. A portrait of the owlets from this box. 1) Even though Barn Owls are found in the same nest boxes each year, they are seldom the same birds that had previously used that box, nor the owlets that had grown up within that box. 2) Barn Owls frequently nest close to other birds of prey, including Great Horned Owls, Swainson’s Hawks and Long-eared Owls. Often with little confrontation. 3) Adult Great Horned Owls will, at times, take adult and young Barn Owls, but it appears to be infrequent. 4) Barn Owls can lay up to 16 eggs in a nesting season. They have been documented double-clutching. When they do this the female can lay up to 10 eggs in the first clutch and 6 in the second. 5) Adult female Barn Owls lay an egg every two-to-three days and begin incubating when the first or second egg appears. 6) We have seen Barn Owl chicks hatch at 28, 29, 30,and 31 days after incubation has begun. 6) Even though Barn Owl eggs are laid on different days, two eggs have been known to hatch on the same day. 7) Barn Owls feed heavily upon small destructive animals such as voles, mice and rats. They will occasionally take birds including meadowlarks, starlings, swallows and other songbirds and American Kestrels. 8) Young Barn Owls remain in their nest for 60 days, or so, before fledging. After fledging, young Barn Owls are completely able to successfully hunt for themselves. 9) A single male Barn Owl can bring in over 20 small animals to his nest in a single evening. 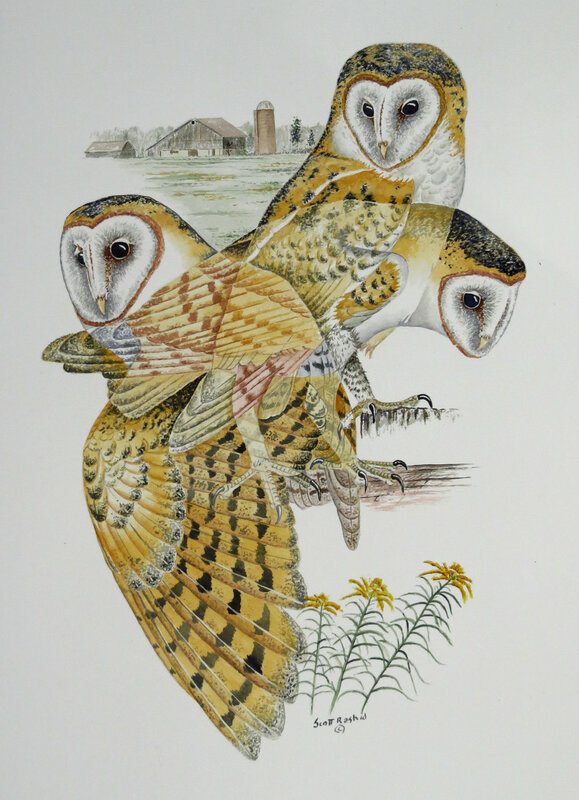 10) Barn Owls may be the most beneficial bird in North America. A pair of owls with owlets can consume more than 800 small animals in a nesting season.